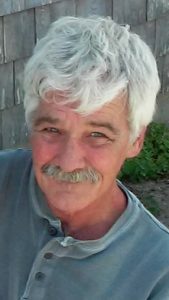 Joseph Cleary, 61, of Oak Bluffs, died peacefully with family by his side on Dec. 3, 2018, at the Royal Megansett Nursing Home in Falmouth after battling Alzheimer’s disease. Joseph was born to James and Joanne (White) Cleary on April 2, 1957. In 1971 the Clearys relocated to Oak Bluffs on the Vineyard, where he went to school and later Martha’s Vineyard Regional High School, graduating in the class of 1977. He worked as a house painter for more than 30 years, and along the way was proud to employ his two daughters to work alongside him. Joseph was a man of few words, but had great advice; strong, yet gentle. He was handsome, fun, loving, creative, and an extremely hard worker. He enjoyed working, fishing, car shows, collecting antiques, collecting in general, showing off his work, people watching, coffee and coffee talk, ice cream. He loved everything about “the Island,” but above all, spending time with friends and family. Joseph is survived by his daughters, Jaime Bodreau and Nicole Cleary; their mother/best friend, Mary (Collins) Cleary; his son-in-law, Adam Tucker; his five grandchildren, Tiana, Jonas, Jazaiah, Janaya, and Kaya; his siblings, Janice, Jason, and Jeffery Cleary, and Jerilyn Dube; his aunt, Paula (White) Driscoll; nine nieces and nephews, four great-nieces, a great-nephew, lots of cousins, good friends, and two very best buds, Mark and John. Visitation will be held at Chapman, Cole and Gleason Funeral Home, Edgartown Road, Oak Bluffs, on Saturday, Dec. 15, from 9 to 10:30 am. A memorial Mass will follow, celebrated at St. Augustine’s Church, Franklin Street, Vineyard Haven, at 11 am. There will be a reception at the VFW following the Mass. Donations may be made in his memory to Alzheimer’s Research, 8180 Greensboro Drive, Suite 400, McLean, VA 22102, or at alz.org. Next articleDr. Antonio Dias Teixeira Jr.